EVENTUALLY, WE MANAGED to get to Happy Valley. 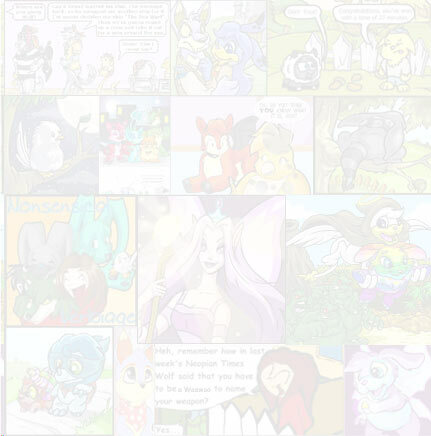 Dozens of Neopets of all shapes and colours were milling around, chatting, preparing for their respective events. Angel and I removed our skis and rejoined our families. Father looked seriously at me. I glared back. "Wait in the centre of the square, Holly," Mother said more kindly. "After all our events we'll be right back." They went off, and I sat miserably down to wait. Another Snow Fest, and I was stuck doing completely nothing. Suddenly I felt a tap on my shoulder. "Holly," said Angel gently. "Come with me." Curious, I followed her around one of the street corners. Tokum and J.J. were waiting there, smiling. I looked at them. "What's going on?" J.J. held something broad and flat and yellow out to me, and I gasped. "How did you guys get my snowboard?" "Picked it up off the mountain after you left," Tokum grinned. "I think there's still time before the snowboard events start. You're still entered, you know." Joyfully I hugged each of them in turn and we all four headed off to the area for the snowboarders to wait. "Name?" asked the Bruce dressed in a red fur-lined coat and hat. "Snowpaw�Snowpaw�Ah, here you are. Say, you wouldn't be related to old FrostPromise?" "It's a surprise for me to see an Usul here, let alone a Snowpaw," the Bruce continued. "Mostly they're skiers, I would have thought." "Well, just do your best out there," smiled the Bruce. A young Wocky pushed past me to the front. "Hechaq Longtail," he said to the Bruce, and then turned to me. "Do your talking on the halfpipe," I snapped. "We'll see," he sneered, and then he strolled away. A little Kacheek carrying a board stepped up to me. "Stand up to Hechaq Longtail," she replied. "He's the champion boarder you know. He won the Junior Division last year." "Well, I'm just out to show them all that they're wrong about Usuls," I said fiercely, looking in Hechaq's direction. "Everyone says Usuls don't or can't snowboard- I'm going to show that they can and they will!" I watched my family ski. Snowbelle and Icechip came in the top two places, Icechip winning by a fraction of a hair, and my parents getting the same results. Soon the ski events were over and it was time for the snowboarding events. My Usullyrn might or might not stay, but whether they did or didn't, I was determined to do the former and win at least the third place. The Junior Neopets, those under a year in age, were already competing. 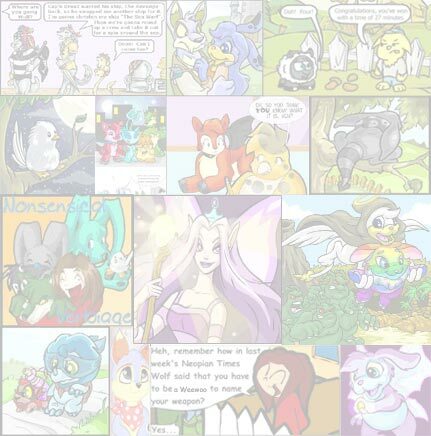 The Young Neopets' division, my event, were slated to go next. J.J. stayed with me while I prepared myself for the event. Her support was comforting, and whenever I got nervous she reassured and encouraged with such kind words that soon I was raring to go. My Usullyrn would have noticed by now that I was missing, and I knew they wouldn't leave without me. "And now, first up to compete in the Young Neopets' Snowboard Championships," called the announcer, "Hechaq Longtail!" I watched Hechaq with narrowed eyes as he shot down the halfpipe. I had to admit he was good; it was clear he was my main opposition. The others after him faltered or slipped or hesitated at each turn but not Hechaq. He stayed firmly on his board and performed trick after trick in rapid succession with perfect ease and grace. The crowd was roaring after he had completed his run, and as he passed me he tweaked one of my ears. I was about to dash after and pound him into the floor but J.J. Held me back. "Look at the rest, Holly. Watch them. Maybe you'll pick up some strategies." Trying to wrestle down my anger, I obeyed, and pretty soon I heard the announcer's voice for the seventh time. "And next to go, Hollyfrost Snowpaw!" "It's literally now or never," I muttered to myself, and pushed off. I can't quite remember what I did exactly. It was almost like a dream. I remember executing a triple-turn somewhere and something else somewhere else but I was following my instincts, following the board, performing everything as I had practised it. It seemed to last an eternity, yet when I slid into the end of the run and got off my board it felt like just a few seconds ago that I had been standing, waiting for my turn. At any rate, the applause was barely heard by me, and I walked out of the halfpipe, emotions mingling in me. Tension, because my family had yet to speak their minds. Satisfaction, because I felt I had done everything to my best ability. And relief; that the whole thing was over. Tokum dashed up to me and hugged me before I could think. "What?" I asked, somewhat groggily. "Did I really do OK?" "You sure did," J.J. beamed, coming up behind him. "That was amazing," Angel agreed. My family was running up as well, as well as the entire Usullyrn. I couldn't read their expressions, and anyway the announcer's voice was sounding again behind me. "And the results of the Young Neopets' Snowboarders is: Second runner-up, Kasari Silvercoat. Runner-up, Hollyfrost Snowpaw, and Winner, Hechaq Longtail!" The applause was deafening. "And I also want to point out," the announcer added, "that Hollyfrost Snowpaw is the very first Usul to ever participate in this event, and that she has done exceedingly well, considering the fact that she has only been snowboarding for three weeks." I looked at J.J. She grinned. "Go, go!" said Tokum, pushing me with a paw. As if in a dream I felt myself walking up to the podium and the silver medal being hung around my neck. The little blue Kacheek I had spoken to earlier turned out to have won third, and we congratulated each other. Hechaq smiled awkwardly at me. "Hey, Usul, just ignore what I said earlier. You were great, I really think so." I looked at him a moment, and nodded, smilingly. "You too." Slowly, I got off the podium and walked over to the Usullyrn. They looked at me, and I looked back at them. Then Ridgerunner burst out, "Holly, that was fantastic!" Immediately, every Usul in FrostPromise was patting me on the back and congratulating me on my achievement. "We saw the whole thing!" My father pushed through the throng. He looked as if he didn't know whether to hug me or reprimand me. But eventually, he opted for the former. "Thanks�Dad." He didn't seem to mind that. Mother, Snowbelle and Icechip all came in and hugged me at once, and then stepped back as I waved for attention. "I would seriously like to give most of the credit to J.J., this Shoyru. She has helped me so much and taught me so well. Couldn't have done it without you, J.J." J.J. slightly covered her face with a wing embarrassedly as the Usullyrn cheered. Chillbane walked up wearing an admiring look. "That was great, Holly. Maybe you'd care to board with me sometime? While I ski, of course." I smiled; then looking at Tokum, shook my head. "Thanks, but no thanks." Diamond, Winterheart and Sugarfrost looked at me in awe. "Gee, Holly," said Diamond, "do you think you can forgive me for everything I said about you?" I smiled. "Of course she will," Angel broke in quickly. "And now everyone, let's go back home to celebrate!" The suggestion was met with roars of approval. "I've got to get back home," J.J. said. "My owner will be worried sick. Congrats, Holly. See you tomorrow?" "Same time, same place," I replied, grinning, as she scurried off. Tokum took one of my paws, Angel the other, and with my family and the rest behind, we led the way up the mountain and home.